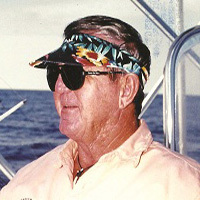 Ron Hamlin is considered one of the sport's most innovative captains and accomplished anglers. At 15 he started training as a mate; a year later he was working with Captain Frank Ardine on the Sail Ahoy. He tagged his first sailfish in 1960; today that number has grown to five figures. In 1971, Hamlin got his first job as a captain and won the Walker’s Cay Blue Marlin Tournament-- the first of many wins. A worldwide fishing explorer, he and his crew were the first Americans to fish Venezuela’s La Guaira Bank where he caught that country's first 1,000-pound blue marlin. For more than 40 years his innovations-- including wind-on leaders spliced with Dacron; formaldehyde baits; pitch-bait techniques; and a 1998 pledge to fish only with circle hooks-- have had a revolutionary impact on the sport. With more than 25,000 billfish releases, Hamlin has spent his career not simply breaking records, but shattering them.